Beauty and the Geek jeans from Nieuwe Heren are embedded with a pair of speakers, a wireless mouse and a keyboard. Nieuwe Heren’s Erik de Nijs designed these concept jeans that “combine two totally different worlds, the world of fashion and the world of technology.” In 2008, writer Bruce Sterling of Wired published Erik de Nijs’ personal statement about the jeans on Beyond the Beyond. 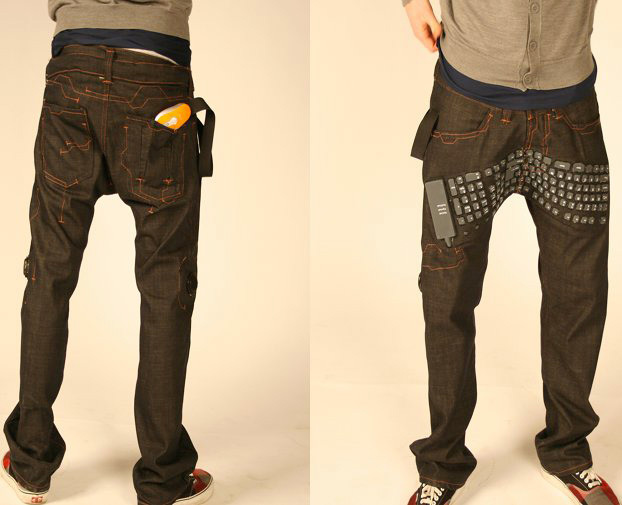 So I came up with the idea of putting a keyboard in your pants, and to make jeans with all the important computer stuff (like a mouse, keyboard and the speakers) in it. Besides the new look the jeans would get, there was some sort of freedom behind your computer screen. You didn’t have to be stiff behind your screen, but you can move in any position you want because the keyboard would be in the same place. I made jeans I would like to wear. In holland, we say baggy jeans. These jeans are a bit loose, so there was enough space to build in the keyboard and the speakers. The jeans I made is a concept which is designed to work with a wireless bluetooth connection. In the model I made, this connection is not there, but a plug is connected to your laptop. This plug looks like a belt, which is put around your waist when you’re not connected. If I develop the model, I will make it with a full wireless USB connection because it is possible. But for the model I had to make in 3 weeks, I used a plug connection. If I would design a new model, I would do some things different.